"ACCURATE" To meet the demands of clients and procure them the finest performing wares is our motto and this drives us to bring some of the finest machines for our clients. We are proudly presenting Relax Drum Machine especially developed shrinking process for bulkiness and gouge effect on synthetics fabric.Relax Drum Machine process like sizing, scouring & creasing, process can be done in high temperature high process. Fabric is loading from front door in side specially developed octagonal basket and that basket rotating forward & reserve direction with the help of inverter. Which has been designed specially to fulfill all the demands of modern industries. Relax Drum Machine offers new kind of technical advantages with regards to process time,energy consumption and fabric appearance. Fabric Loading Capacity 200 Kgs up to 800 Kgs. Presure Vessel and all wet part of machine made of stainless steel AISI 304 L, highly Corrosive resistance. Specially Developed Octagonal, Perforated Basket. Also can drumming without bags. 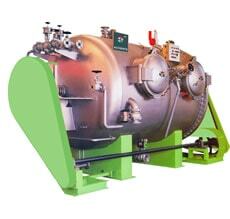 All safety device required for a pressure vessel are incorporated with the machine. Heavy Duty Planetary gear box for basket rotating forward & reserve direction. Planetary Gear box direct couple for driven by frequency inverter control motor. Heavy duty base frame (Box type) for drum body.